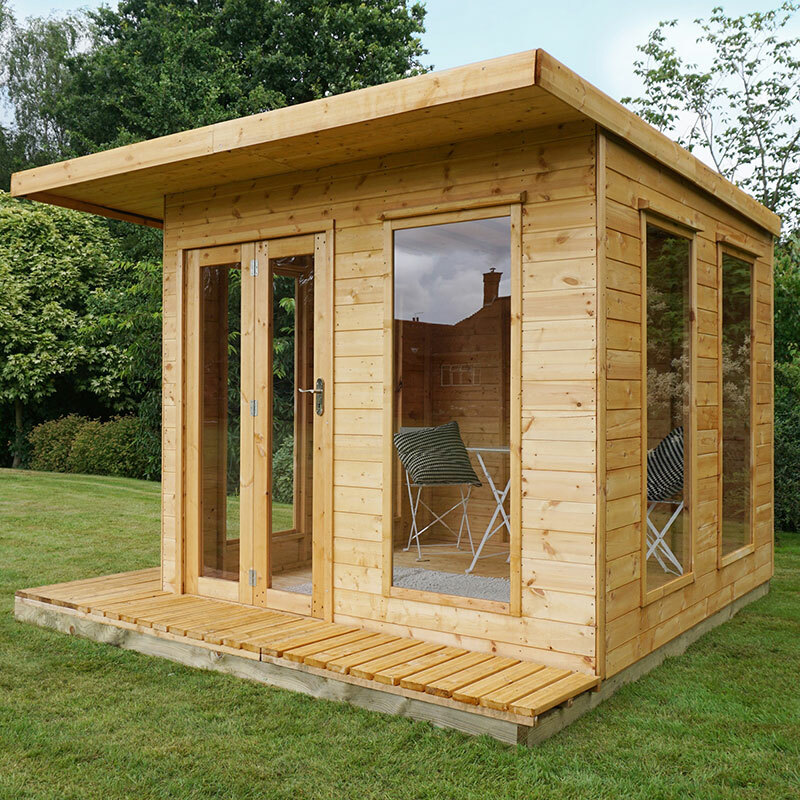 This 10x10 Helios Summer house is a perfect addition to any garden, allowing for the fresh outdoors to be enjoyed this summer by the whole family. Its contemporary design means it stands out in any garden and is guaranteed to receive nothing but compliments. The 12mm tongue and groove cladding creates an extremely strong construction, of which can withstand even the toughest of weather conditions. The timber selected has been chosen due to its high resistance to rot and moisture damage meaning that this 10x10 Helios Summer house will provide shelter for many summers to come. The roof is made from a tongue and groove timber which is both durable and has been curved to allow for fast and efficient water run off. The double doors on this 10x10 Helios Summer house open up to allow for an open plan summerhouse perfect for gatherings, when not in use the lock and key adds security. Six large windows provide plenty of natural light and have been made from styrene, a safe glass alternative which is shatterproof eliminating any chance of damage from smashed glass. 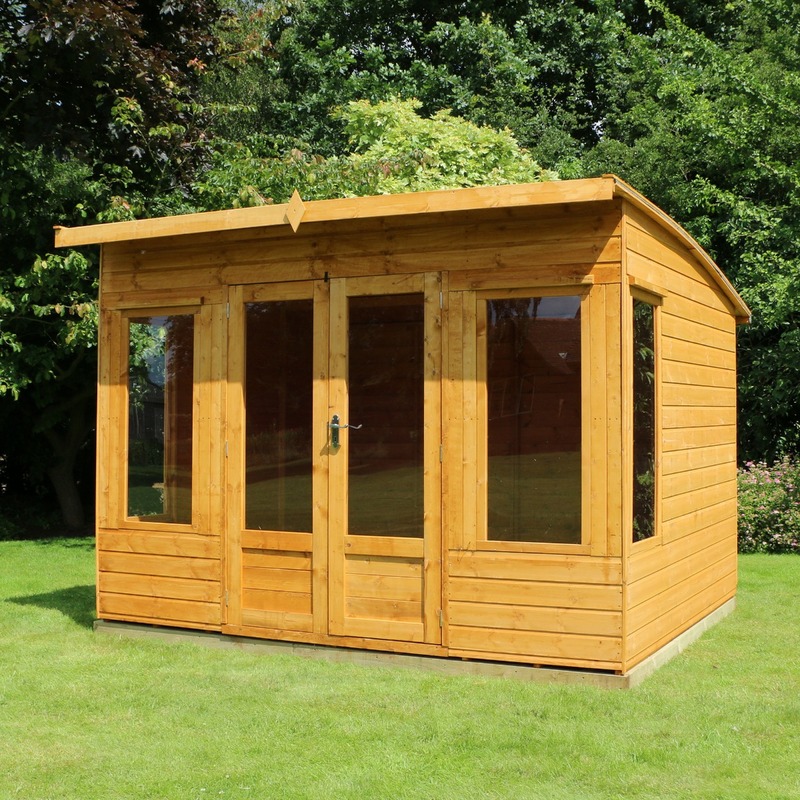 This 10x10 Helios Summer house has a 10 year anti–rot promise, of which we advise to re–treat annually with a timber preservative to maximize the 10 years. Assembly time has been shortened thanks to the pre–hung windows and doors and is simple to build. In comparison to other Summer houses on the market, for the price, this large Helios summer house is a marvelous deal and offers great value for price. A visually stunning contemporary designed 10x10 summer house with curved roof, offering a spacious additional living space. Its 12mm tongue and groove wall cladding, floor and roof ensures an overall sturdy build and making it extremely durable. Six large styrene windows and glazed doors ensure plenty of natural daylight flows into this summer house. Wide opening double doors ensure easy access to this spacious summer house, allowing for furniture to be moved in and out easily. To ensure the assembly of this summer house is as quick as possible, the windows and doors have been factory fitted.